Agent Carter was originally scheduled to return this week for season 2 – the State of the Union caused the bump – and now the two-hour event will air January 19 instead. For now there are some new character portraits and TV Line has the exclusive selection featuring characters old and new. We’ve picked a couple of our favorite shots which showcase costuming, red lipstick and general DGAF attitude. This is very much the face of someone who knows their value and it will be interesting to see if Peggy gets more respect after the events of last season and with a coast change. Costuming wise it is similar to last season with red and white being signature colors with only blue missing from the palette. This is a more informal setting than the promo material last year which saw Peggy brandishing a gun and wearing a red Stetson Stratoliner. However, you can see Peggy standing defiant in an all blue dress with red trim in the season 2 key art; gun in hand, sans hat. Hayley Atwell is well suited to this period of clothing (as Restless and Any Human Heart can attest – watch both mini-series’ if you can) and I am very excited to see what costume designer Giovanna Melton has got in store for us this year. 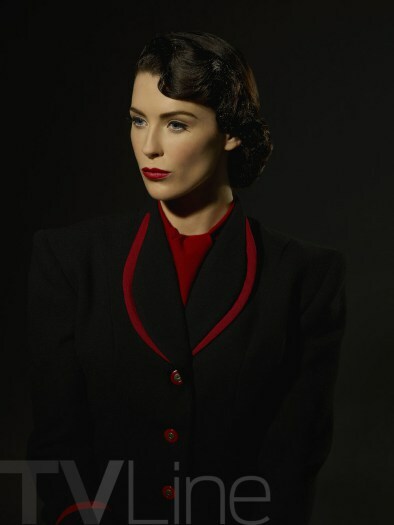 A stunning stone cold fox and I would not expect anything less from Bridget Regan as Dottie; another role in which Regan excels at playing super sweet and then turns out to be the big bad. It’s going to be fun watching the pair go up against each other now it is all out in the open and Dottie is just as formidable as her rival with the added advantage of being part of what appears to be the original Black Widow program. Basically, don’t mess with her. Peggy looks directly at the camera in her character photograph engaging the viewer, whereas Dottie is devoid of any emotion and appears detached. The red of her lips, blouse, buttons and trim stop her from melting into a sea of black and it is an incredibly affecting shot. These women come from very different places and their methods vary – one is far more inclined to kill to get what they want than the other – and this is the one relationship/conflict I am most excited about seeing develop this season. To view the whole gallery head here and check out where Agent Carter featured on our Best of 2015 list.